Students protests what they say are contract non-renewals. District responds. 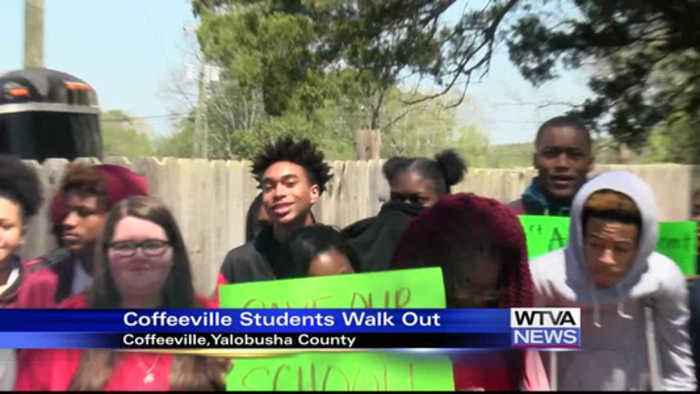 Some 36 students protested what they say was the non-renewal of three coaches contracts by walking out ofschool . Wtva's wayne hereford has more. :00-:06 :17-:27 :30-:35 :39-:47 1:02-1:11 the students say they are mad because three coaches contracts were not renewed by the school district. They say its something they can't accept. One coach, in particular, they say is not only a great coach but a great teacher as well. His name is michael cathey. "our problem was the fact that he actually got our school to a ninety-percent passer rating on our u.s. history last year and he got our athletes to state twice. So we feel like they can't say he didn't do his job as a teacher and a coach." "and when we try to go to the superintendent she doesn't reach out to us, she doesn't answer us." The parents who were there say they full support the students move. "i'm out here in support of my dauther and the other thirty-six students. Its time for them to be heard." Meanwhile the school district spoke by way of a statement saying that: "we want to thank the students and parents for voicing their concerns today. However, this is a personnel matter that we by law cannot discuss. We appreciate all the students complying and returning to class. The important issue right now is our students and then to returning to class in order to complete their pathway toward graduation. Parents we solicit your support in ensuring our students are successful and they do not do anything to jeopardize their current academic standing. We pray that we can move forward for the betterment of our students parents, district and a community." Standup.."now concerned parents will meet friday to discuss the issue here in coffeeville. In coffeeville wayne hereford wtva nine news.